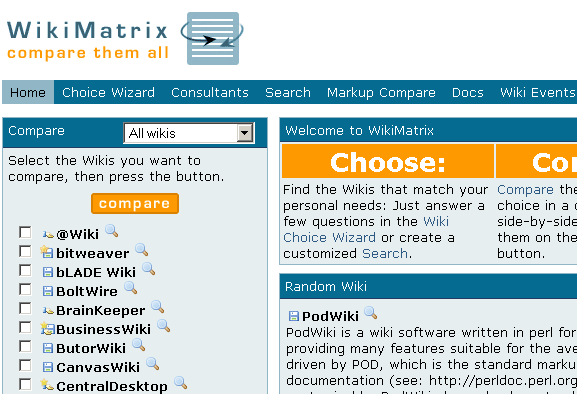 WikiMatrix make the task easy and lets you compare wiki platforms in one place. You can compare wikis from the list side by side, or find a Wiki that matches your personal needs by answering few questions in the Wiki Choice Wizard. It’s free. If you still have questions, you can use the forums to ask questions from other users or get a professional support from a consultant in the Consultant Marketplace. Find a wiki platform that suits your needs in one place, for personal or enterprise use. 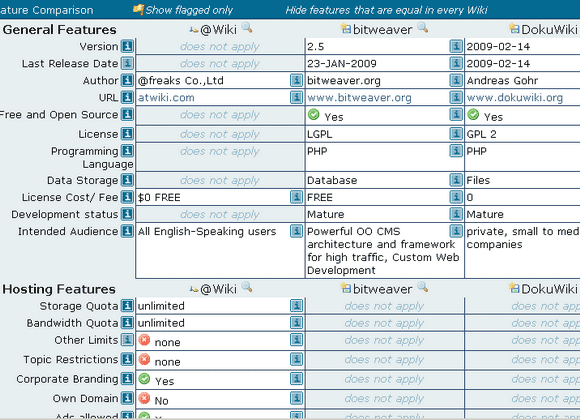 Compare 100+ popular wiki software side by side. Find the best Wiki for your needs by answering few questions in the Wiki Choice Wizard. Discuss different wikis and get help from other users on the forum (sign up needed). Browse professional consultants in Consultant Marketplace to help you deploy wiki for your enterprise. Free and no sign up. Now, you can follow MakeUseOf on Twitter. Recommended! MakeUseOf 'Geeky Fun' - Hillarious Geeky Pics and Videos from different parts of web. April 9, 2009 by Ben Pike.